Who Let the Puppies Out!? The Reality · Members' Area · The Genius Bar · News Desk · Who Let the Puppies Out!? Finally, we have posted our 2018 Cub Adoption listing up in Wolf Central. You can check it out here! Instructions for adopting a puppy can be found in the first post of the thread. Expectant parents, please see the first post of the thread for your character's due date. It isn't required that you begin your thread on the date posted, but it cannot be started before that date. Puppies will be playable beginning three weeks after their birth date. 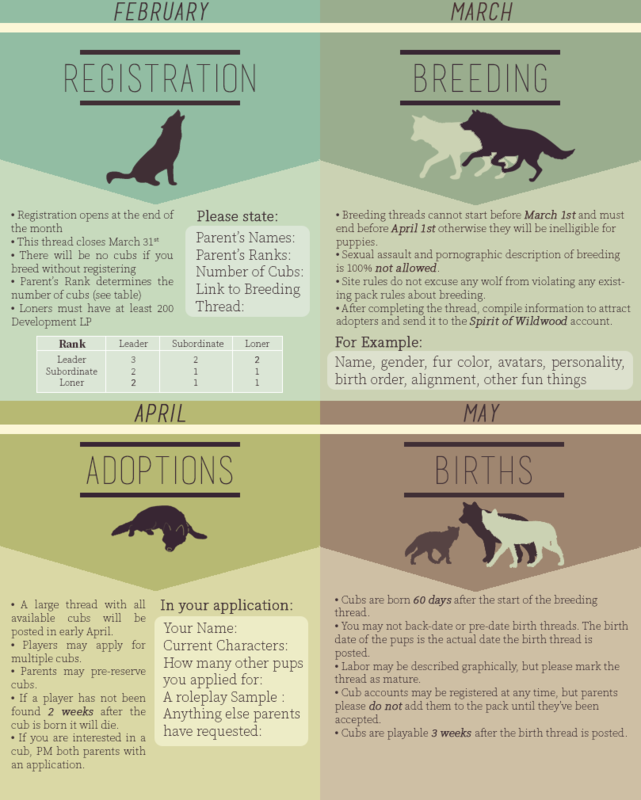 If you're wanting to adopt a puppy, we strongly recommend that you read through our Puppy Development Guide. Puppies are fun, cute, and adorable, but they have their own restrictions when it comes to RP, so please keep this in mind before applying. Feel free to consult the "April" portion of the infographic!